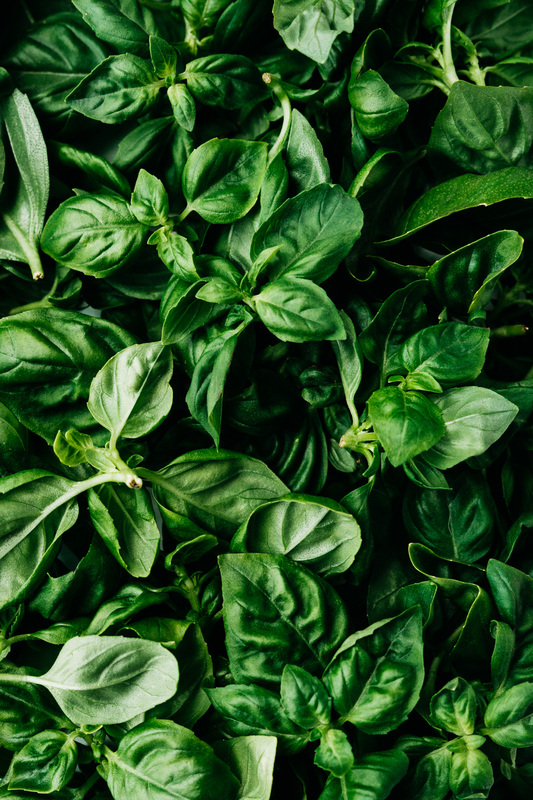 Today I’m talking about preserving basil. This is the final post in my series on simple preserving and I hope you’ve enjoyed following along and that you’ve learned something new and been inspired to do some preserving of your own. Remember that preserving doesn’t need to be complicated, time consuming, or fussy. You don’t need to fully stock your freezer or pantry all at once. It’s about connecting with the seasons, getting to know your local farmers, and reducing packaging waste one ingredient at a time. Throughout this series, I’ve chosen to focus on how to preserve the things that I use regularly based on my dietary preferences. Your preferences may be different and that’s totally fine. Anything is fair game when it comes to putting food by. However, when choosing what to preserve I recommend focusing on things you know you’ll actually use. This may sound obvious, but I can’t tell you how many weekends I’ve spent preserving things only to have them take up space in my pantry or freezer all year and then end up in the compost. Think about what you reach for over and over again at the store (jam, pickles, dried fruit, tomato sauce, frozen peas or corn, frozen berries or peaches etc.) and choose one or two things to DIY. You’ll save money, time, and reduce waste by not getting carried away and preserving more than you can use. I like to freeze a big batch of pesto every summer to toss with pasta, spoon over roasted potatoes, or add to soup during the long winter months. This is my favorite pesto recipe but you can always improvise and make your own version with garlic, toasted nuts/seeds (almonds, pine nuts, sunflower seeds, and hazelnuts are all good choices), basil (plus any other greens or herbs you have on hand), quality olive oil, and salt. Just whip up a big batch of your go to pesto, transfer to small containers, and freeze for later. I actually have a second full sized standing freezer in my barn for all the summer excess! I always freeze in one layer on a sheet tray and transfer to bags or bins later. I took the advise of someone (maybe you) and stopped blanching my veggies. I used to get such inconsistent results. Not all veg freezes well, but corn, broccoli, green beans and ratatouille all live for now in my freezer. Berries and stone fruit as well. Mostly whole or sliced. The exception being strawberries which I make into a freezer “jam” Really just cooked down with a little sugar and so good on toast in February! The blueberries usually turn kind of mushy when defrosted but this year they have retained their plumpness and are almost like fresh, I guess it is just the variety but it is a pleasant surprise. I love eating through the winter and watching the freezer empty out. By spring it will be clear and I can start over. Love hearing about your preserving! Keep up the good work! This series has been great! My freezer is almost full right about now. Interestingly, with containers of most of the wonderful produce and recipes you’ve shared! Since you asked, in addition, I also enjoy preserving peaches. I slice them, lay them on the cookie sheets, and then after a day or so, I pack them away, so that they maintain their integrity. I enjoy them in yogurt and baked goods through the winter months (along with the berries). Thank you for getting the word out in your “Simple Preserving” series. It brings us one step closer to sustainability. Yay! I’m so happy to hear that.